Black Friday has become associated in the popular imagination with queues of desperate shoppers busting down the doors to their local megastore to (almost literally) grab the latest discounts. The ensuing Cyber Monday is a nod to the reality that online shopping, whether by mobile devices or laptops and desktops, is a huge trend. But even so, Black Friday itself witnesses a major amount of money changing hands online. That’s why last year we rocked out our animated data visualisation showing mobile and desktop purchases over Black Friday. 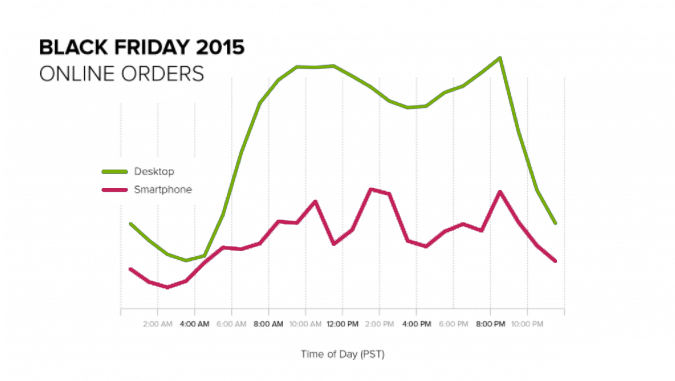 We wanted to show you what 24 hours of intense online shopping looked like across the day. The result was something quite beautiful, at least we like to think so. So this year, back by popular demand (our mums are very proud of us), we give you our 2017 Black Friday online shopping data visualisation (though it could probably do with a catchier name). What you will see is a beautiful (and, ahem, profitable) dance; around 1000 balls floating about the screen, each one representing something in the region of $3.5 million worth of spending. The colour of the balls refers to the devices used to make those purchases; smartphone (pink), tablet (blue) and desktop/laptop (green). We wanted to show you the rate, as well as volume, of spending throughout the day, so to that end that we tapped into a database of more than 60,000 consumer apps and drew on records of customer purchase behaviour from the last three years. The data-backed dance you will see tells a story, and it’s also quite hypnotic to watch. You’ll notice that the soap suds are barely dry on the Thanksgiving crockery rack before shopping begins; a splurge of spending between midnight and 2AM with another bump around 5 AM, presumably from workers on the early shift. Things are cooking nicely from 7AM, with a fairly consistent stint of heavy spending between 9AM and 9PM. Lunch breaks don’t appear to have an impact on spending, suggesting bosses are turning a blind eye to such a shocking lack of discipline (or are themselves prowling Amazon). Basically, the shopping patterns track the waking hours of the average American consumer, with some spikes in the wee hours to reflect the unsociable hours of the shift worker. Shoppers are grabbing any spare time they can to make the most of the day’s discounts. Our visualisation reflects the healthy increase in Black Friday spending year on year (2016 saw a 12% boost on compared to 2015). In fact, in 2016 there were higher levels of internet traffic on Black Friday than Cyber Monday. Internet traffic on Black Friday was 251% higher than the November average; compare that to Cyber Monday when it was up 172% above the average. This stat doesn’t just bring home the fact that the Black Friday period is a lucrative time for retailers, it shows that online and offline spending go hand in hand. When you add to this the fact that Black Friday also generated nearly twice as much revenue as Cyber Monday (a 384% increase vs 190%) it shows that online retailers should take Black Friday as seriously, if not more seriously, than Cyber Monday. Crucially, conversion rates were also up compared to November, (a 152% boost on the Friday compared to a 114% on the Monday). And it was all going on in Europe, with France seeing a 250% increase in traffic and Spain cashing in a whopping 700% boost in revenue. There’s no doubt about it, Black Friday has truly gone global and Cyber Monday is increasingly looking like a quaint reference to a time when online shopping was seen as somehow a niche activity. Black Friday is morphing from a day or two of frenetic spending to a week-long period with Black Friday shoppers taking advantage of deals in the week leading up to Cyber Monday. A 12% lift in spending on Black Friday may have been the headline, but that doesn’t take into account the fact that the four days prior to it saw anything from a 23% to 33.7% increase in spending. The entire Black Friday period saw an estimated £6.45bn spent on online sales in the UK. This year could see a projected £7bn of online spending. So don’t sit around patiently waiting for the Friday to unleash your offers, there’s a whole week where you can draw in highly motivated shoppers. One striking fact that our visualisation brings home is the rise of spending via smartphones. They are by far the most popular electronics device, beating both laptops and tablets. 85% of UK adults use them, a figure that has soared from 52% just five years ago. Smartphone adoption for the under 45s rises to over 90%. In fact, it was smartphones that saw a staggering 47% year on year sales growth last year, underpinning last year’s rise in total online sales, a trend that’s only set to continue. 71% of 55 to 75-year-olds in the UK now use smartphones, that’s a higher portion than all UK adults combined in 2014. Online retailers should be aware that a whole generation of Baby Boomers are increasingly going to be spending via mobile devices. They own half of all UK wealth and are woefully under-targeted by advertising. Something to think about. Salesforce predicts that, globally, mobile traffic will grow to represent 60% of online traffic across the 2017 holiday season. This trend looks set to continue, so make sure you’re poised to make the most of it. Understanding consumer behaviour will really help you out when maximising your share of the growing Black Friday market. Most shoppers (74%) do their pre-shopping research via a retailer’s website… 43% use email, and 36% will check out a retailer’s mobile app. So make sure your website provides a pain-free experience for shoppers and guides them smoothly to your products and thence to your online store. You should have a fit for purpose emarketing strategy in place too, particularly in the run-up to Black Friday. Start your campaign around two weeks in advance; it’s a good idea to have offers that you can roll out throughout the week. Another interesting stat from last year’s data shows that email reminders are an effective tool for reducing the number of abandoned shopping carts. An average abandonment rate of 70% for the rest of the year was suppressed to 67% on Black Friday. 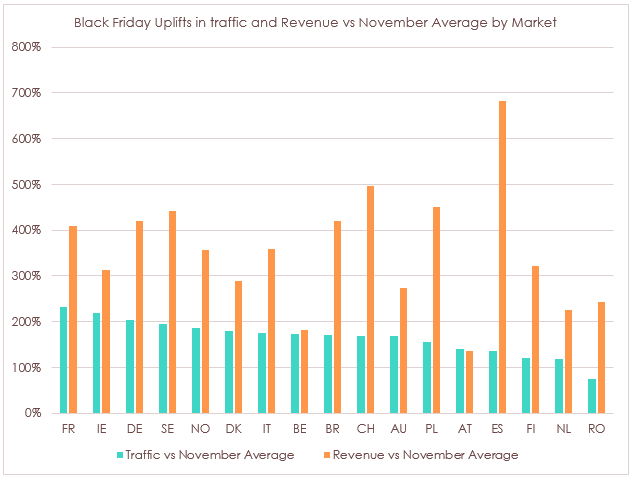 Basically, shoppers have a stronger motivation to buy over the Black Friday period as, particularly in Europe where Thanksgiving isn’t celebrated, it effectively fires the starting pistol on the Christmas shopping period. That means that sales activation techniques like automated emails, social media outreach and app promotion are likely to be even more effective than they would normally be during the rest of the year. Given that over a third of consumers do research via retailer’s apps, it’s a good idea to promote your existing app if you have one or look into getting one designed for next year. So, there’s some Thanksgiving food for thought. 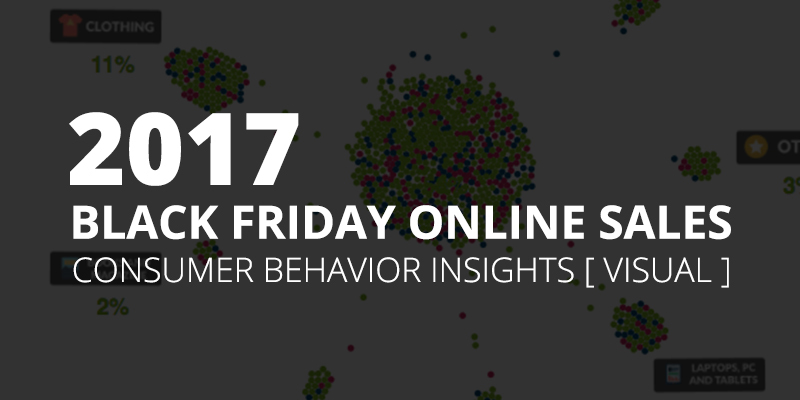 But right now, in this moment, take a few moments to chill in front of our shiny Black Friday data visualisation, then maybe it’s time to schedule a friendly pep talk with your marketing team.